A really splendid CARLTON WARE boat-shaped dish. 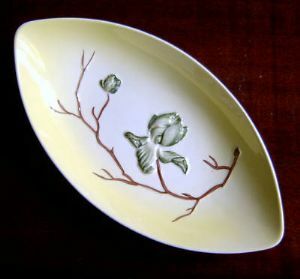 It is vintage Australian Design, handpainted in their Magnolia Range. It dates from a very small manufacturing period of only two years: 1959-1961. It has a two-tone yellow and cream ground with dark green magnolias on dark brown stems. It is backstamped and had the impressed pattern number 2605/2. It measures almost 11 inches (27 cms) in length with a maximum width of 5.75 inches (14.5 cms). It is in perfect condition with no chips/nibbles nor visible wear and tear to the topside but there is a very small nibble to the rim base about 3mm square, otherwise it would be perfect overall.